Accident Attorney Victoria: Injured At An Amusement Park? Call Now! With warmer temperatures on the horizon and school only being in session for a few more months, you and your family are probably starting to talk about vacation ideas. Visiting an amusement park is exciting and full of memories for the young and young at heart, but it’s imperative to make sure that everyone is exercising caution and safety at all times. If you’re planning a fun park visit soon, this article will remind you of some important safety rules to remember and follow. If you or a family member is injured on a ride or in a theme park, call The Law Offices of Alex R. Hernandez Jr., PLLC. With a team of experienced personal injury and accident lawyers, we can take on your case with compassion and zeal. We also have two locations in Corpus Christi and Victoria, Texas for your convenience. Call us today for legal advice! Vacationers and thrill-seekers come from far and wide to experience the scary joy that comes from bungee jumps and roller coasters. 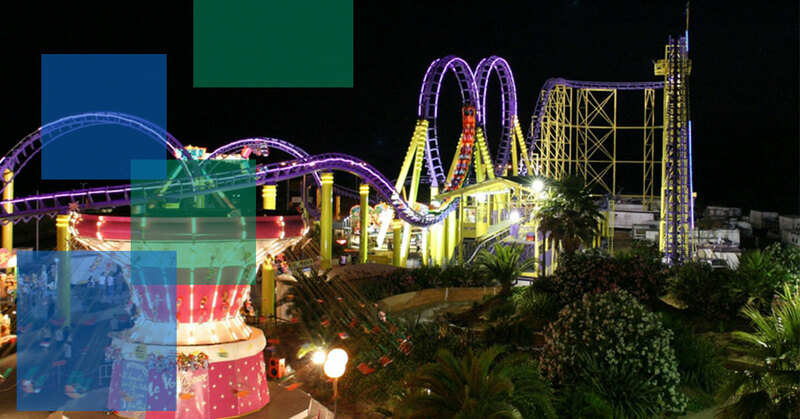 Our great state of Texas boasts many exciting theme parks, including Six Flags Fiesta in San Antonio, Six Flags Astroworld in Houston, Wonderland Park in Amarillo, and Schlitterbahn Galveston Island in Galveston. If you’ve never had the amazing experience of encountering the adventure and delight of a Texas amusement park, planning a trip to a local water or fun park should be your next plan for a vacation. There is something for everyone at amusement parks, with electrifying rides, delicious food, and exciting entertainment perfect for the whole family. With these locations being extremely popular and crowded during vacation season, it’s important to inform your family members and yourself of safety precautions to take to ensure that everyone has a wonderful time. Always wear sunscreen. You probably know already that the hot Texas sun in the summer is brutal, so to avoid turning into a family of lobsters, make sure you’re applying sunscreen often. Sunburns are never fun and can detract from an exciting vacation. Stay hydrated. In the hot sun, dehydration can set in extremely fast, and the effects can make you very ill. Take water breaks often and if you or a family member is feeling disoriented or nauseated, take action quickly. Wear appropriate footwear and apparel. Loose clothing such as skirts, dresses, and oversized outfits could lead to accidents, and uncomfortable shoes can lead to blisters or sore feet. Always follow directions. This is imperative to your safety and the safety of others. If you don’t understand the directions or are confused, make sure to ask for clarification before you climb on the ride or buckle in your straps. Explain the directions to younger children as well and confirm that he or she understands. Implement the “buddy system”. If you have several children, make sure they always have an older kid or adult with them at all times. In case your family gets separated, the younger child will have a companion to get him or her to safety. Establish an emergency plan. If someone does get lost, talk about what the next actions should be. Choose a central place in the park to meet and note if there are places where medical attention or first aid can be given. This may also be a good time to purchase prepaid cell phones for younger children to have with them so he or she will have a way to contact the authorities or you if an accident happens or he or she gets lost. You can program your and your spouse’s cell phone numbers in the phone, as well as other important numbers so it takes only one click of a button to place a call. Always follow ride restrictions. It can be hard for your youngest child to sit out of riding the new roller coaster attraction, but if he or she doesn’t meet height, weight, or age restrictions, he or she needs to wait for an appropriate ride. It’s also important to note health restrictions, if any are mentioned. If you’re concerned about health issues affecting a ride, you can call the park beforehand to ask about certain rides. Keep your arms and legs inside the ride at all times. Always follow this rule. Remind any young children that you have with you to do the same. Ensure that any and all loose articles of clothing are secured. If you have a hood on your jacket or sweater, tuck it into the back. This also applies to any bags or backpacks you may have, if you’re not instructed to leave them at the gate at the ride. If you’re not comfortable with carrying your bag onto the ride with you, you can let a family member hold it until you get off. A fanny pack or other bag that lies close to your body is also a good idea for theme parks. Remain seated until the ride comes to a complete and full stop. Always follow the instructions of the ride or attraction operators. Don’t question them and listen carefully to every direction they give. I was Injured at an Amusement Park. Do I Need a Lawyer? Your fun summer vacation just came to a screeching halt after an unforeseen injury. While it’s easy to assume blame and brush it off, it’s important to know your legal options. You may be entitled to compensation from the amusement park, especially if it can be proven that it was their fault. If any injury has occurred due to the park’s failure to ensure the safety of you and your family, the park can be held as negligent. If you feel that the Texas amusement park where you were injured is negligent, it’s important to take legal action. To receive compensation, you have to prove the four elements of negligence: duty, breach, causation, and damages. Duty: duty means simply that it was the park’s duty to enforce safety at the park at all times. If this wasn’t done properly, their oversight can be seen by a court as failing to create a safe environment for their guests. Breach: This aspect of negligence corresponds with duty, but a breach means that the standard that was set was not met correctly and so an injury or accident that ensued should not have if a breach hadn’t occurred..
Causation or Cause: This is often referred to “but-for”. “But for” the actions of the defendant (the park), the plaintiff (you) would not have suffered an injury. This is what is proved in court by evidence, such as video footage, witness accounts, and medical information. For example, if the roller coaster operator had remembered to have the ride serviced properly, you wouldn’t have been injured by the malfunction of the controls. Damages: You must prove through medical records, bills, treatments, surgeries, ambulance rides, hospital stays, etc that you were injured in result from the defendant’s mistake. Preexisting health issues don’t usually apply to these cases. It’s also imperative that you practice reasonable care. If you choose to not receive medical treatment or refuse to have your injuries evaluated by a doctor, you may not be eligible for compensation because there is no legal evidence such as a doctor’s records to prove your injuries. While the thought of being injured at an amusement park may make you think twice before booking your vacation, it’s important to remember that amusement park employees and ride operators are held to incredibly high safety standards. The great state of Texas understands that amusement and water parks attract families and children, so they are legally required to follow strict safety requirements to ensure that children will not be harmed or placed in danger’s way. Staying safe is your ultimate goal when enjoying a few days at a theme park here in Texas. If your family or yourself did not experience a secure experience at an amusement park and you feel that the park could be held in negligence, call a lawyer you can trust today. The Law Offices of Alex R. Hernandez Jr., PLLC understand that an amusement park injury can be a real bummer for your summer plans. If you’ve been hurt in a Texas theme park and believe that the park is at fault, call us today. Our seasoned and experienced lawyers will review your case and give you excellent legal advice. We want to protect your rights and make sure that any compensation that you may deserve is given to you. Call us now!